You may have noticed that I haven’t blogged for a while. I have been away, on holiday. I did no writing whatsoever, and I was in an Anglo-Saxon free zone. 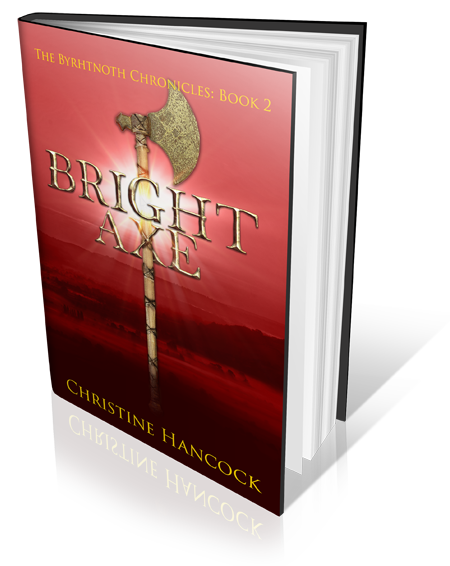 Plenty of Vikings, but the Anglo-Saxons didn’t get that far north – not to settle anyway. Perhaps they visited, perhaps they were taken there. Can I use this in a future book? An interesting thought. To return to the present. I have been on “An Archaeologist’s View of Orkney and Shetland” It was a coach tour run by Brightwater Holidays. It was a holiday I had looked at several times before, but rejected because of the number of ferry trips. My other half is not keen on ships, but this time he made an exception. Perhaps my wistful remarks had sunk in (not exactly the right word? ), perhaps it was the proximity of a special anniversary, but he agreed we could go. Luckily all crossings were calm. The holiday was only six days, so we added three nights in Yorkshire at the end “to recover”. We didn’t fancy the long drive home – Yorkshire was quite far enough, but you can read about that later. 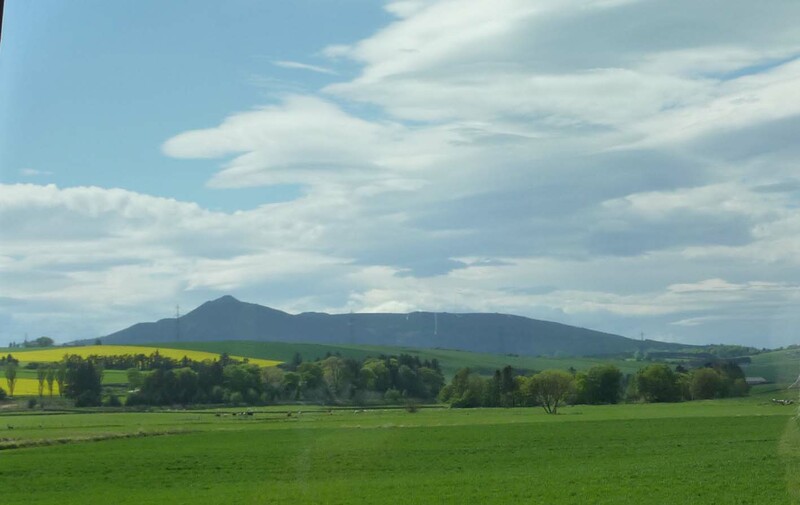 Brightwater Holidays offer a selection of departure points, so we decided to drive to Edinburgh. We spent the night in a hotel near the airport and were picked up by the coach at 9.15 the following morning. There were only six of us to start with, including our guide Alan Braby. He was not “as advertised” but had stepped in at the last minute, because the original guide was unavailable. He did an excellent job, apart from a slight difficulty in telling left from right, usually at the end of a busy day. But we got used to it. I’d rather have an archaeologist who does a bit of guiding than a guide who knows a bit of archaeology. Driving the bus was John, from Glasgow. He was responsible for much of the organisation and was capable of taking a full size coach to places I never thought it could go. The first stop (a comfort break at a garden centre near Perth) provided some unplanned history. There was a view from the car park of an ancient building. The signs said Huntingtower Castle. The name was familiar. It was the site of the Gowrie Conspiracy of 1600. An attempt on the life of King James VI of Scots, soon to be James I of England. I had read a book about it a while ago. Blood of Kings by J D Davies. The author writes books on naval history and also historical fiction set in the 17th century (the latest book in the Quinton Journals, a prequel, includes this bloody event in Scottish history). The coach continued to Aberdeen, where we picked up more passengers and the airport, where the last of our group joined us. The tour proper had started. 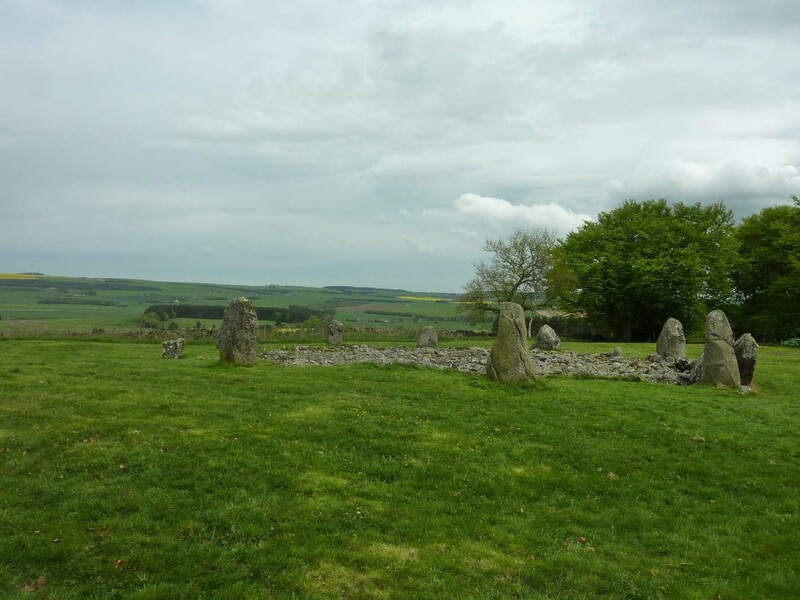 We drove out of the city to visit the Loanhead of Daviot Stone Circle, near Inverurie. This is a recumbent stone circle. Was this a circle of fallen stones? No. 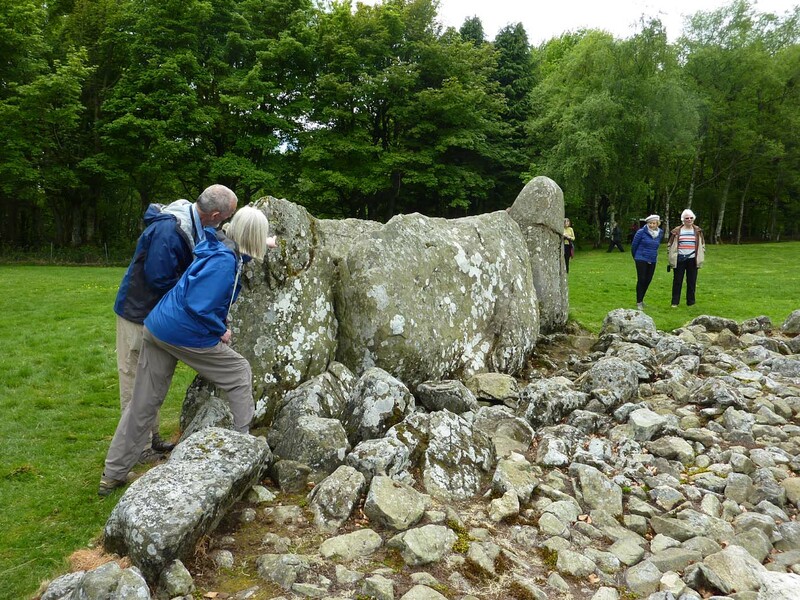 This type of ancient monument is found only in this area of Aberdeenshire (and Ireland) and features a large stone lying on its side supported by two flanking stones. It was built about 5,000 years ago and aligns to positions of the moon. It is a pity that the main alignment south-west to Mither Tap and the summer moon, is obscured by trees. We spent a lot of time spotting alignments in the surrounding landscape and someone noticed another recumbent stone circle opposite. 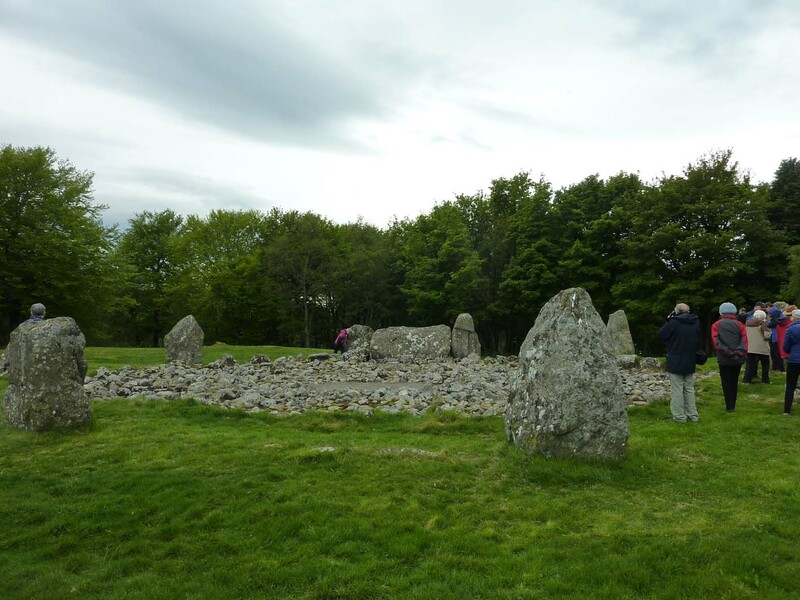 1500 years later, a cremation circle was built beside it and later still a large cairn was built in the centre of the circle. It would have been taller than the stones, but most of the rocks have been reused, probably to build walls and houses in the vicinity. All this was done by the local people, farmers of the surrounding land, probably ancestors of the modern inhabitants. A wonderful demonstration of continuity; something we were to discover time and again on this trip. Stone Circle, showing remains of the cairn in the centre. 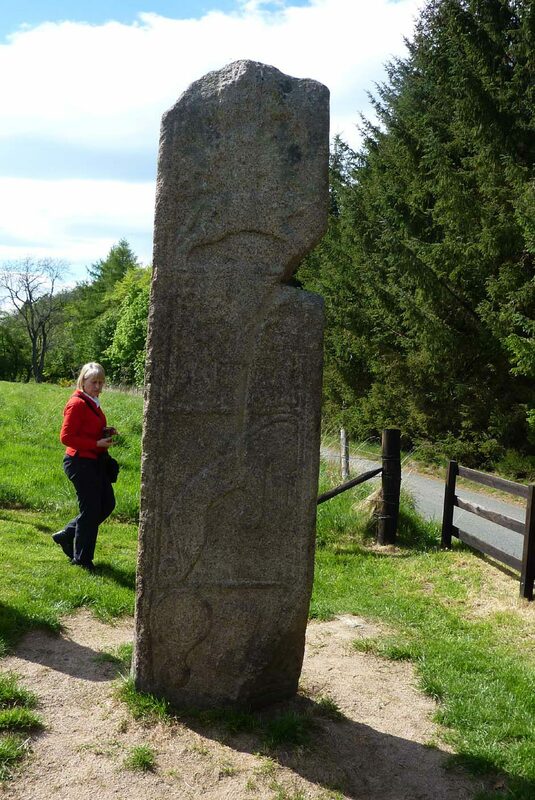 We then drove closer to Mither Tap to the Maiden Stone, a slab of granite, over 3m tall . The maiden who gives it its name was a local girl who made a wager with the devil, and lost. 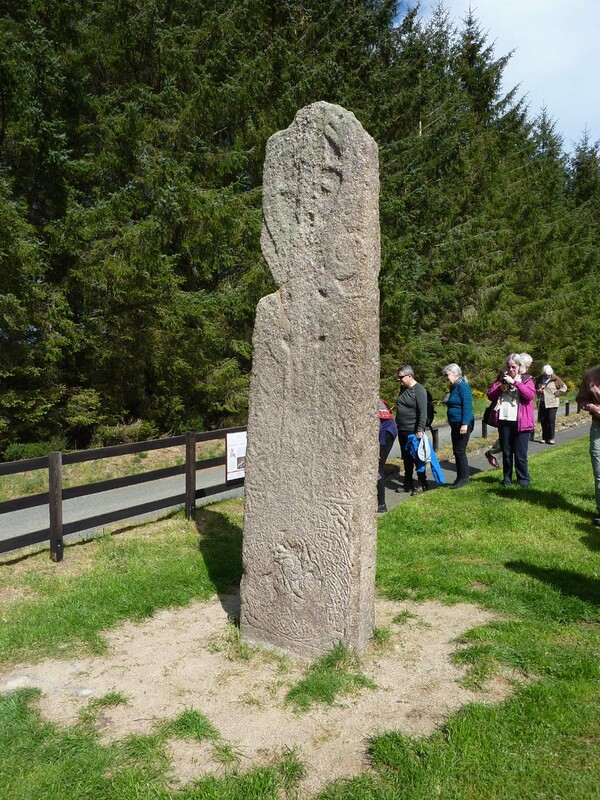 In fact it is about 1200 years old, and Pictish. On one side is a Christian cross, on the other, mysterious Pictish symbols. It is very worn and it was difficult to make out the carvings, although by this time the sun had appeared. There is a mirror and a comb, but what is the animal above them? There are suggestions that is an elephant, but I think I’ll go with the dolphin theory. Maiden Stone. Pictish images difficult to see. 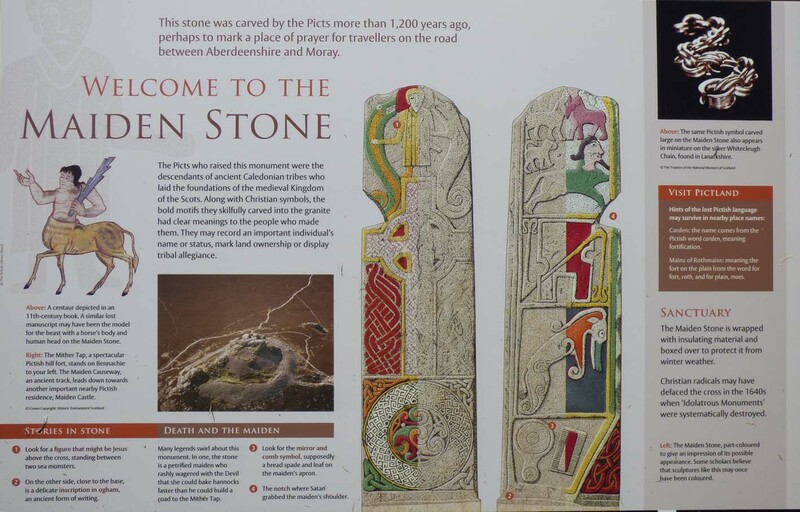 Display board, showing details of Maiden Stone. An interesting start to the holiday. We returned to Aberdeen, to board the ferry which sailed at 7pm. 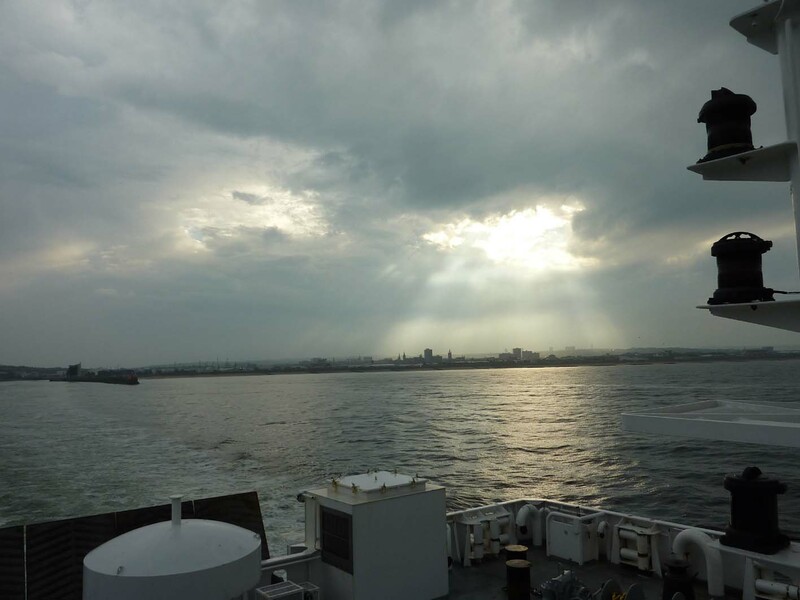 We watched the departure, before having dinner on board. As this was the first meal since we had stopped at the garden centre, I was starting to wish I had had eaten something then, instead out spying out interesting old castles! Then it was to bed in our cabins. Next day we would arrive in Shetland. ← Getting towards the end – but where is it? Sounds like an amazing start to your holiday. Love the photos too! I think this holiday is going to run to several posts. I took over 500 photos – not all of them will be included, I hope! Part two should be up soon.